This mama looks amazingly radiant as she stands in this gorgeous summer glade with the sun peeking in to see her. 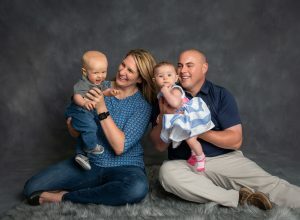 Celebrating her second pregnancy, she wanted to capture not only the growing little boy that was still baking in her womb but also the last days that her family was still a family of three. Little Drew was so excited to hug his mommy’s belly and his little brother inside. We braved some pretty persistent mosquitos for these photographs, but all they will remember was the happiness and hope they felt while they awaited the arrival of their newest family member. Not every woman wants to get maternity photographs taken. In my experience, I find about 1 out of every 4 moms wants to get maternity photos created. But, I absolutely recommend that every mom-to-be get maternity photos taken at least once (assuming that you might be pregnant more than one time). Being able to look back at this miraculous time in your life is such a gift to yourself. Taken right at sunset, the beauty of the Connecticut River and skyline make this beautiful summer maternity photo just stunning. If you are interested in getting maternity photos taken, contact me as soon as possible. The ideal time to have these portraits taken is between 32-36 weeks.